The WAT-902H3 ULTIMATE (1/3" format) is the newest and lowest light gather monochrome camera offered by Watec. With practical application in mind, Watec redesigned the base platform of the 902 series cameras to gain more sensitivity and make available functionality control of the camera providing the user the ability to apply this camera to nearly any application requiring near IR visibility and full camera control. 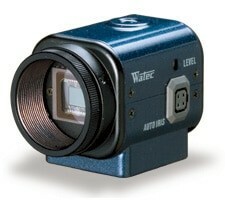 This camera is also available as a package kit solution coupled with our APAQ2000 series, outdoor waterproof housings.